We have included this group of stallions as a reference point since they have, and continue to influence our breeding program. These stallions have sired foals on our farm. You will notice that these stallions are mentioned at various places on our sales page. We are proud of their accomplishments both as show horses and sires. They continue to have a positive impact on the miniature horse breed. This wonderful stallion, sired by Komokos Little King Supreme, was the backbone of our breeding program for years. He has sired many foals for us and has had a wonderful impact on the miniature horse industry by introducing elegant movement to the breed. Napoleon has sired numerous national award winning offspring in both Halter Conformation & Performance, winning the prestigious titles of AMHA Honor Roll Champion Get of Sire and World Res Champion Get of Sire. He was the leading AMHA sire of Single, Country and Roadster horses for a number of years. We used Napoleon daughters as an integral of our original breeding program. Natural refinement in miniature horses is a most elusive and difficult trait to attain and breed for. 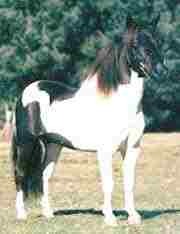 Brewer’s Orion Mystic is without a doubt one of the most highly refined miniature horses alive. 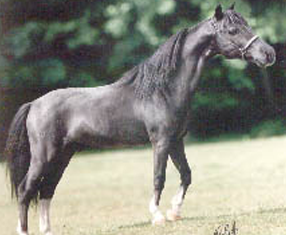 Mystic is a direct son of the legendary sire Orion Light Van’t Huttenest. 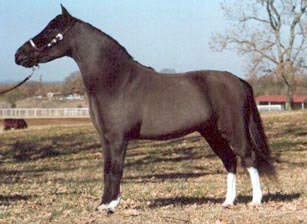 Mystic, himself was the National Champion Weanling Stallion in his brief show career. 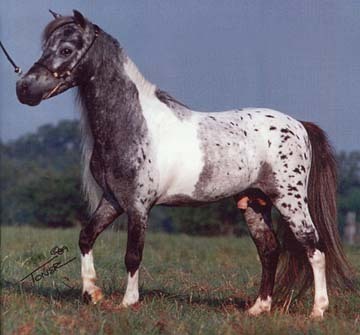 He measures 30 inches tall and possesses genetics to produce pinto and appaloosa color patterns. Mystic’s offspring have inherited his elegant refinement and presence. They are noted for their very erect carriage, long highly placed neck, small chiseled heads and clean body lines. Mystic offspring are natural show ring performers with expression and attitude beyond compare. Mystic offspring have excelled at the Regional and National levels. They have brought home such awards as National Champion and Reserve Yearling Filly and Colt Futurity Champions as well as numerous other National Futurity winners. Mystic is the 7th lifetime leading sire in the nation for futurity earnings with only a limited number of offspring shown. This is a major accomplishment when you consider the relatively small number of foals he sires each year. His get have consistently been recognized in both halter and performance classes. Numerous National Top Ten Halter winners as well as National Honor Roll Award winners have earned their place at halter, driving, and other performance classes. 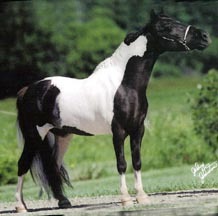 He sired the 1998 AMHA NATIONAL RESERVE GRAND CHAMPION JUNIOR MARE – Scott Creek Mystical Dynachrome. Dynachrome was shown also as a mature mare. She was the 2000 NATIONAL RESERVE CHAMPION SENIOR MARE. 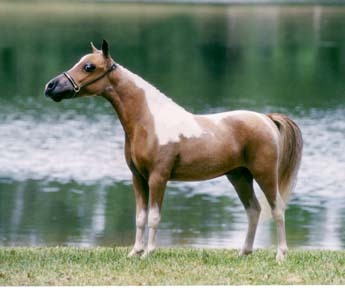 In 2001 another Mystic daughter, Scott Creek Mystic Monique, was crowned the NATIONAL GRAND CHAMPION JUNIOR MARE. 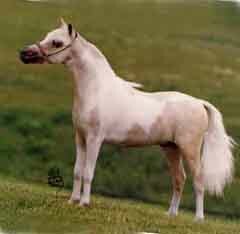 This is the highest and most sought after award in miniature horse conformation classes. We are very proud of the undisputable fact that Mystic was an exceptional sire. We are even more proud of the fact that this fine stallion had the genetic prepotency to pass on traits to his offspring that result in their development into very proportional and elegant adult horses. This is truly a rare genetic factor in the miniature horse breed where a large percentage of the horses do not remain proportionate and naturally refined as aged horses in the under 34″ miniature. For one stallion to produce offspring with presence, movement, natural refinement, and attitude in the miniature horse breed is almost unheard of. Mystic was truly one of these rare individuals. When you compare the quality and competitive success of Mystic’s offspring to other stallions, it is difficult to find many that parallel his accomplishments. This outstanding World champion jr. & sr. top ten pinto stallion has the famous Rowdy in his pedigree. He has an outstanding head, eye and body. We have kept the beautiful daughter, Scott Creek Sure Hit for our broodmare band. This fine old legend resided at our farm from the time he retired from stud at Brewer Family Miniatures in Texas. Dynamo is found in the pedigree of many World Champion daughters & sons and now granddaughters and grand sons. His direct son, Rhotens Little Dandy is probably his most famous offspring siring many halter and driving World Champions. Offspring having his expansive movement are much sought after by driving enthusiasts. Born in 1979 he passed away in 2015 at the age of 36. Known as an AMHA sire of significance, in his lifetime, Orion has sired more National Grand Champions than any other miniature horse. One of his most famous national champions is our own lifetime leading futurity sire, Brewers Orion Mystic, the foundation sire of our broodmare band. The Orion/Mystic line has a special, refined elegant look that can be picked out even in the successive generations. Windwalker” is an amazing horse for being only 28″ tall. This stallion has the most animated movement and erect carriage of ANY miniature horse we have seen in all the years we have been in the business. When you see him move he gives the appearance of a dynamic and bold American Saddlebred. He has naturally high knee and hock action for such a small horse. His neck is highly placed on his shoulders with an alert, sculptured head. Windwalker is sired by nationally recognized sire Little King’s Napoleon and out of a Brewers Orion Mystic daughter named Scott Creek Mystical Mariah. This fine young stallion brings out the traits of both Napoleon and Mystic. His show record is exemplary. He has placed National Top Five 28″ and under Stallions in the two years he has been shown. He has also been a Regional Champion Liberty horse which is obvious evidence of his movement capabilities. 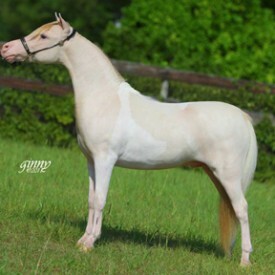 In addition he has been numerous times Champion and Supreme Halter horse at local shows.